Based in Malibu, Calif., Shannon Sukovaty has been writing health-related articles since 1992. Her work has appeared in ‚ÄúColorado Health‚Äù magazine, ‚ÄúHealth and Fitness Journal‚Äù magazine and on various websites. Sukovaty is a certified personal trainer with undergraduate studies in exercise physiology and credentials from the Aerobics and Fitness Association of America and the American College of Sports Medicine. Seniors should do some type of aerobic exercise for at least 30 minutes every day, according to FamilyDoctor.org. Dancing is an effective way to add aerobic exercise to your weekly routine. 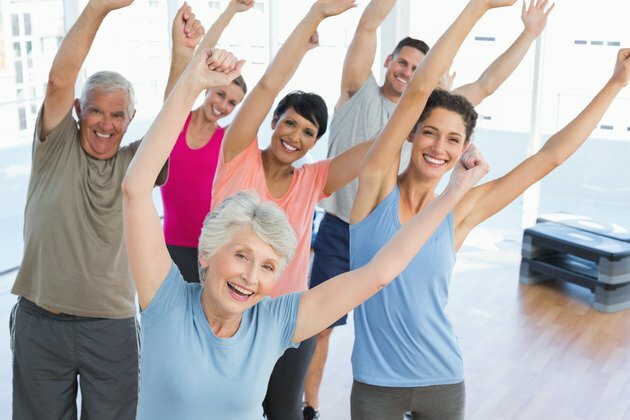 There are many dance exercise DVDs that you can use at home, or check out your local community center for dance exercise classes that are specifically for seniors. Always check with your doctor prior to beginning any new diet or fitness program. Dance exercise is an aerobic activity that burn calories, works the heart muscle and is appropriate for any age and level of fitness. Dance requires constant movement at your own pace, which elevates the heart rate to pump oxygen faster through your blood. This is what makes it aerobic, or cardiovascular. Doing aerobics five to six days a week can help improve your energy levels, reduces risk of high blood pressure, heart disease and diabetes, strengthens your heart and improves your overall mood. The American Council on Exercise suggests that dancing for aerobic fitness also can help improve your memory. Many types of dance exercise programs are available and there are many ways you can use dance for fitness. Many community centers, churches and school programs offer senior dance exercise classes. Classes such as low-impact aerobics, salsa, jazz, tap, martial arts style dance, ballroom and even chair aerobics are easy to join since you can work at your own pace. Prior to beginning a new dance exercise class ask the instructor if you can watch or try one class for free. This will help you decide which style of class is right for you. Choose a class that provides clear instruction and is for any level. If you prefer working out at home choose a DVD that is appropriate for your skill level. Another way to use dance as aerobic exercise is to turn on your favorite music and move. Dance exercise also can be effective physical therapy for seniors. Dance therapy improves gait and balance in seniors, which can decrease your risk of falling, according to the April 2010 Science Daily. Dance therapy encourages seniors to move in different directions from everyday movement. This helps improve overall balance, stamina and walking speed which are major risk factors in falling. Dance therapy classes are offered in many hospitals and health centers. When participating in dance exercise always make sure you are working at a level that is comfortable for you. Your heart rate should stay at a comfortable pace and you should never put stress on your joints or back with any movements. If you have back or joint problems have your doctor advise you on modifications. There are a wide variety of dance exercise programs for all ages and skill levels, but many people are afraid to try it, thinking you have to know how to dance prior to taking a class. Most dance exercise classes require no formal training and are taught in a way that anyone can do it. Many dance exercise classes offer a trail class to see if it is right for you. Prior to trying the class talk to the teacher about any concerns you may have. American Council on Exercise: What Are the Benefits of Dance Inspired Workouts? How Long Should I Dance to Burn 500 Calories? How Does Dance Affect the Body? Is Freestyle Dancing a Good Exercise? What Are the Benefits of Ballet for Kids?